On this day in 1896 George Washington Carver, a recent graduate of Iowa State College of Agriculture and Mechanical Arts, now Iowa State University, accepted an invitation from Booker T. Washington to head the agricultural department at Tuskegee Normal and Industrial Institute for Negroes, now Tuskegee University. During a tenure that lasted nearly 50 years, Carver elevated the scientific study of farming, improved the health and agricultural output of southern farmers, and developed hundreds of uses for their crops. 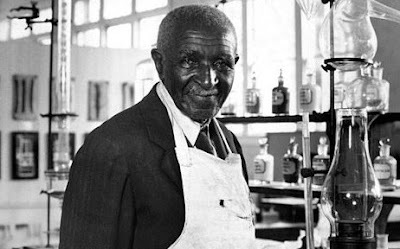 As word of Carver's work at Tuskegee spread across the world, he received many invitations to work or teach at better-equipped, higher-paying institutions but decided to remain at Tuskegee, where he could be of greatest service to his fellow African Americans in the South. Carver epitomized Booker T. Washington's philosophy of black solidarity and self-reliance. Born a slave, Carver worked hard among his own people, lived modestly, and avoided confronting racial issues directly preferring to undermine segregation, prejudice, and discrimination by means of the excellence of his work and the indispensability of his service. When he arrived in Tuskegee, Carver faced a whole host of challenges. The facilities were abisimal. Funds for the agricultural department, which consisted little more than a dilapidated barn, a cow, and a few chickens, were altogether non-existant. Nevertheless, he simply rolled up his sleeves and went to work. A resourceful individual, he assembled a small group of students to collect materials that could be used to construct laboratory equipment (pots, pans, tubes, wire, and anything else they thought might be useful), and made the tools and devices necessary to conduct agriculture-related experiments. Carver also had to overcome concerns among the students; many of the students at Tuskegee associated agriculture with sharecropping and poverty. They were generally much more interested in learning the various industrial trades which would allow them to work in the factories and mills of urban America. But Carver knew better: the soil was the surest path toward self-sustaining community. Quietly and resolutely he dignified farming by infusing the discipline with science: botany, chemistry, and soil study. Over the course of just a few years, Carver's department, began attracting the best and brightest students. Over the years, Carver only patented three of his 500 agriculture-based inventions, reasoning, "God gave them to me, how can I sell them to someone else?" He lived frugally, accepting only a small portion of his salary, and donated his life savings to a fund in his name that would encourage research in agricultural sciences. In 1916 Carver was appointed to The Royal Society of Arts in London, England, and in 1923 he was awarded the prestigious Spingarn Medal for his contributions to agriculture. His ingenuity and resourcefulness can be seen today in the hundreds of scientific and artistic items on display at the Carver Memorial Museum on the campus of Tuskegee University. This is great stuff. I just read "Up From Slavery" this year, but I know almost nothing about GW Carver except that he invented peanut butter. I had no idea that he and Booker T. were connected.